APPLICATION - Our standard Terms and Conditions apply equally for all verbal or written contracts. The acts or omissions of the passengers are the hirers responsibility, therefore if any additional cost incurred for the performance of the contract they rest entirely with the hirer irrespective of whether or not the hirer travels with the party. QUOTATIONS - All quotations are subject to KC Travel. All quotes are giving in good faith. KC Travel with quote you on a vehicle and driver available at the time the hirer accepts the quote. The quote is given for driver and vehicle only. PAYMENT - All monies must be paid prior to the hire taking place. Deposits and payments in full can be agreed with KC Travel prior to the date of travel. All outstanding monies due that are not paid subject to travel KC Travel reserves the right to collect the monies from the original credit/debit card used by or for the hirer at ant time. The hirer agrees that no charge back will be raised to any debit/credit card issuing company with regards to the booking payment. USE OF VEHICLE - The hirer cannot assume the use of the vehicle between outward and return journeys NOR will the vehicle remain at the destination for the hirers sole use unless agreed with KC Travel via email or writing. KC Travel reserves the right to levy additional charges if mileage or times go over or above the original agreed amount at the time of the booking. KC Travel does not accept liability financial or otherwise whereby the customer fails to attend at any pre arranged locations. SEATING CAPACITY - All vehicles will clearly state the maximum number of passengers allowed. Therefore K C Travels drivers will not allow extra passengers, nor will they allow standing passengers. All children travelling on a KC Travel vehicle must have a car seat if they are either 1.35 meters in height or under the age of 13. It is the hirers/parent/guardian responsibility to provide the car seat for the journey. It is also your responsibility to insure that the child/children are correctly restrained at all times during the travel. KC Travel will not except any responsibility for the children or car seat while travelling with KC Travel. CANCELLATION BY THE HIRER - All cancellation must be made in writing to KC Travel. Please be aware cancellations made by the hirer the following charges will apply. Within 72 hours before the DATE of hire - FULL CHARGE. 7 days- 14 days before the DATE of hire - 25% will be due. Prior to the date of travel and date of cancellation of travel all monies owning to KC Travel will be at the cost of the hirer they will be held responsible for all payments regardless whether you travel or not. 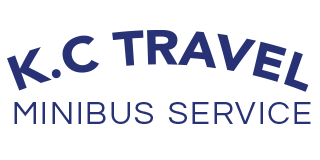 CANCELLATION BY KC TRAVEL - In the event of a emergency, unforeseen vehicle issue unforeseen cancellation , or at the request of the hirer to vary the originally agreed booking conditions KC Travel will return all monies paid and without liability cancel the contract. However will try our up most to assist the hirer by supplying details of other transport operators but however we can not guarantee this. Please make sure that you the hirer and the passengers have adequate travel insurance to cover unforeseen travelling cost, expenses and losses, due to any of the above taking place. ANIMALS - Are not permitted at anytime unless it is a dog for the blind, if this is the case please can you clearly state that a dog will be travelling on the vehicle with your party when booking. DRIVERS HOURS - Drivers hours are regulated by the law and the hirer accepts responsibility for timings agreed on confirmation of booking. The Hirer must accept that neither he/she or their party of passengers shall delay or interrupt the journey in such a way that it will effect or cause the driver to breach he''s or her driving regulations. If a breach does occur the hirer will be responsible for any additional cost. ROUTE - Unless the hirer stated at the time of booking a particular route and specified time and it was agreed with KC Travel the route will be at KC Travel or the drivers discretion. All vehicles will depart at times agreed by the hirer on the booking confirmation .The hirer will be responsible to account for all passengers at these times. All passengers must only board or leave the vehicle at the agreed points. If they fail to do this it will be at there own liability. BREAKDOWN COVER OR DELAY - K C Travel will advise you on times regarding travel in good faith but we cannot guarantee the completion of a journey at a specific time. We will not be held liable for inconvenience or loss caused due to a breakdown or delay in unforeseen circumstances. If the vehicle is delayed by the hirer or party members KC Travel will allow a 15 min waiting time, this means we will wait 15 min after the agreed pick up time and 15 min after the agreed departure time, the driver will then contact you via the mobile number provided . If the driver waits longer than 15 minutes and is unable to contact you a charge for waiting time may be applied due to breach of contracted times. CHANGE OF VEHICLE - If KC Travel''s allocated vehicle becomes unavailable we will endeavour to match or replace this vehicle. we may provide a larger sized model at no extra cost. KC Travel reserves the right to sub-contract to other coach operators to cover the hire of your travel. PASSENGER CONDUCT - The driver is responsible for the safety of the vehicle. The hirer will be responsible for any damages caused to the vehicle. The hirer is responsible for all passengers at all times. The hirer is also responsible for the behaviour of all passengers on the vehicles at all times. If any soil or damages take place on the vehicle during time of travel you will be charged to cover the cost of rectifying the problem the charge will be applied of immediate effect. An additional daily charge will be imposed should the vehicle be taken out of commissions, due to loss of earnings. Any passengers in breach of statutory regulations will be removed on the drivers authority. Criminal damage may be reported to the relevant authorities. PROPERTY - All property is at the owners risk. KC Travel will not accept liability for any losses or damages while they are carried on the vehicle nor will they take responsibility for any property left on the vehicle it is the hirer or the individual passengers responsibility for there belongings. All vehicles are subject to restrictions on carrying luggage therefore the driver will decide how much luggage should be carried his/her decision is final. WEATHER We reserve the right to cancel your booking on the day if advised to do so due to bad weather (snow,floods,high winds). You will be entited to a full refund but KC Travel will not be held responsible for any other losses. If you have a complaint regarding travel with KC Travel please email us within 7 days of the date of returning from your hire. THANK YOU FOR TRAVELLING WITH KC TRAVEL.